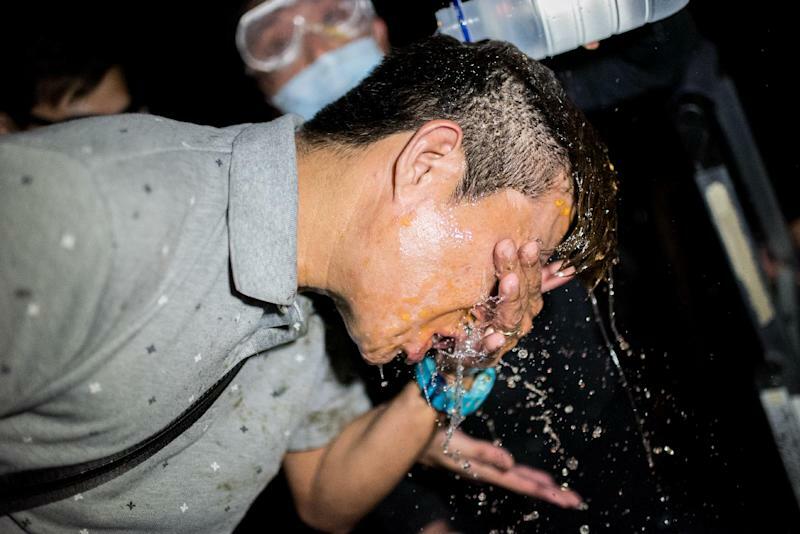 Hong Kong (AFP) - Hong Kong police and protesters clashed early Wednesday, with dozens of officers in riot gear using pepper spray on activists in some of the most violent scenes since pro-democracy demonstrations began more than a fortnight ago. Police also used batons and their gloved fists to beat back protesters guarding newly erected barricades on a main road next to the city's embattled government headquarters, AFP journalists said. 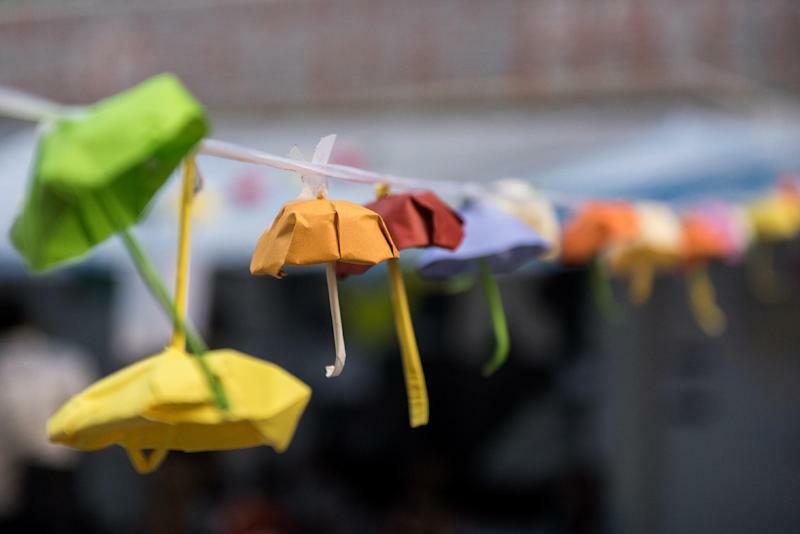 The violence was among the worst seen since the start of intermittent rallies drawing huge crowds calling for Beijing to grant the semi-autonomous city the right to hold unfettered leadership elections. A wall of police marched Wednesday on demonstrators clutching the umbrellas that have become emblematic of their fight for full democracy in the financial hub, striking protesters and shoving them to the ground. Protesters alleged the pepper spray was used indiscriminately and without warning. Within an hour police had regained control of Lung Wo road, which sits just metres from the offices of Hong Kong's embattled Chief Executive Leung Chin-Ying and which was occupied by protesters earlier on Tuesday. AFP saw several protesters being led away by officers, with injuries on both sides. The exact number of those arrested was not immediately available. Ben Ng, an 18-year-old student, was with protesters near a newly built barricade when the baton-wielding contingent approached. "Police used pepper spray without any threat or warning. Protesters were beaten by police," he said. "Both protesters and police, their emotions are very unstable. "The government doesn't want to talk to us and we don't know why. We hope to start talks again as soon as possible because protesters are very tired at this moment." Protest leader Alex Chow reiterated a call on Tuesday for Leung -- whose resignation protesters are demanding -- to restart stalled talks after the government abruptly cancelled a dialogue last week. Late Tuesday, protesters told AFP that they had decided to take over the highway -- which had previously been unoccupied by activists -- after police cleared another main road near the central Admiralty protest site without warning. The protests that have paralysed parts of the city over the last fortnight have largely been peaceful. But angry and sometimes violent scuffles have frequently broken out between demonstrators and government loyalists, sparking accusations the authorities are using hired thugs. Tempers are fraying, with shop owners and taxi drivers losing lucrative business and commuters voicing irritation at their disrupted journeys to work. Journalists were also jostled by security forces on Wednesday and warned they would not be treated any differently if they breached a cordon. Daniel Cheng, a reporter for an online news portal, told AFP: "(Police) grabbed me, more than 10 police, and they beat me, punches, kicks, elbows. I tried to tell them I'm a reporter but they didn't listen." Cheng sported cuts to his lip and bruises on his neck and back. He said he was later released after showing his press card. In the last two days, officers have begun probing protester defences in raids aimed at opening some roads to traffic, while allowing the bulk of demonstrators to stay in place. 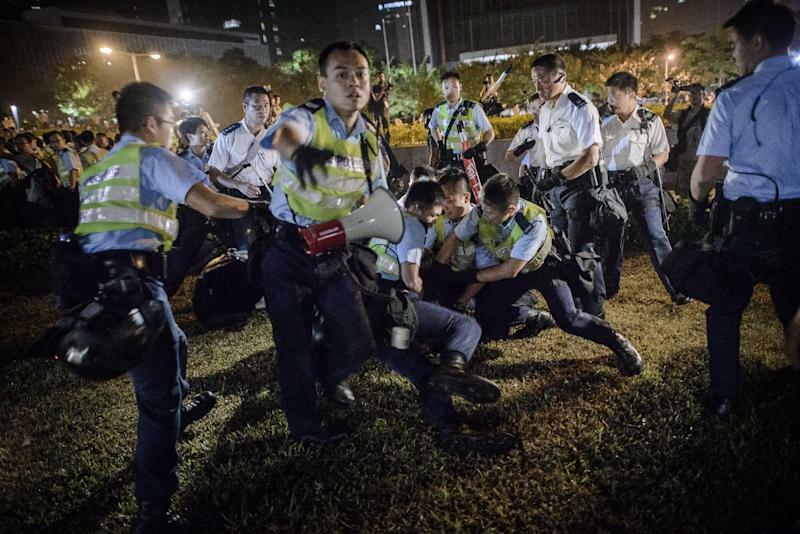 Police had said they would soon turn their attention to a secondary protest site in Mongkok, on the Kowloon peninsula, which has seen violent scuffles between demonstrators and opposition groups, but the area remained quiet overnight. On Monday embattled leader Leung said he hoped the protests would end "as quickly as possible".